He is the head of S.H.I.E.L.D. (Strategic Homeland Intervention, Enforcement and Logistics Division), and in the 2012 movie, The Avengers, he gathers Earth’s Mightiest Heroes to defend the Earth against threats of great power. 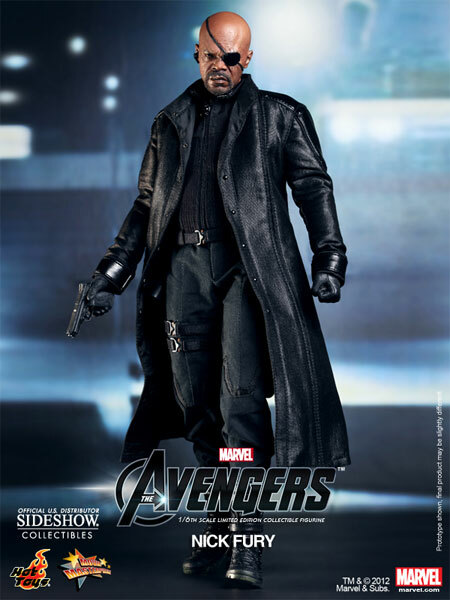 Samuel L. Jackson plays the part of Nick Fury, and his likeness is reproduced expertly here in this figure from Hot Toys. This figure stands approximately 30 cm tall, and has over 30 points of articulation. Fury also comes with multiple accessories including a secret briefcase holding the powerful cosmic cube! Assemble now and pre-order the Hot Toys Movie Masterpiece Series Nick Fury Sixth Scale Figure!